How to Track User Engagement in WordPress using Google Analytics? Wondering how to track and measure user engagement in WordPress? You can use Google Analytics, the most reliable website analytics tool; however, it’s quite tricky for newbies to set up. Fortunately, there’s a smart tool called MonsterInsights that simplifies Google Analytics and lets you track user engagement with ease, no matter what your skill level. In this article, we’ll show you how to track user engagement in WordPress using Google Analytics with MonsterInsights. Why Track User Engagement in WordPress? User engagement refers to the extent people are engaged with your site content. It shows what users do once they’re on your site; whether they read your content, click links and buttons, or simply hit the exit button. In addition, you can learn which content users are most engaged with, which content is leading users to buy your products, etc. Website owners often count website traffic and pageviews as the most important indicator of their website’s performance, but that can be useless sometimes. For example, if your site’s bounce rate nearly 100%, the number of pageviews make no difference at all. Site visitors need to stick around, and become engaged, for your website to truly be a success; no matter what your traffic levels. That’s the reason tracking user engagement is more important for precise website insights. If you know how users are interacting with your site, and how much time they’re spending on your site, then you’ll better understand your site’s performance. From there, you can plan better strategies for your business’ growth. Now, let’s go ahead and check how to track user engagement in WordPress. The first thing you’ll need to do is to set up Google Analytics on your WordPress website. Google Analytics is a free website analytics tool that lets you track your website traffic and provides you with detailed reports. 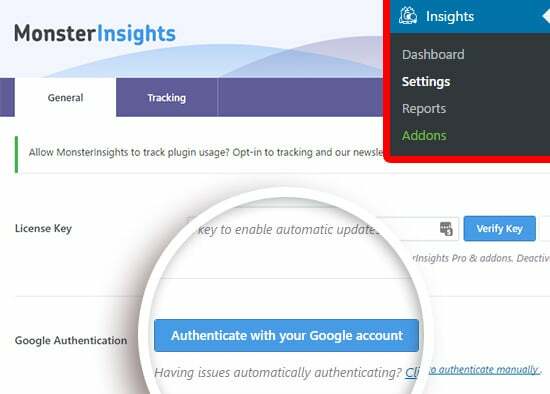 To set up Google Analytics in WordPress easily, you can use the most beginner-friendly WordPress plugin, MonsterInsights. It helps you install Google Analytics in WordPress easily and quickly and provides you with the most comprehensive and beautiful reports right on your WordPress dashboard. MonsterInsights empowers you to use Google Analytics in a smart way without having to touch any code or navigate away from your site. To get started, you’ll need to install and activate the MonsterInsights plugin. Then, you’ll need to authenticate your site with your Google Analytics account. After that, you’re done with the setup. If you need detailed instructions, here’s our complete guide on how to properly set up Google Analytics in WordPress. The first and most basic metric to measure user engagement is time. To see whether users are engaged or not, you can track how much time, on average, they stay on your site. The first report you can view to see user engagement is Average Session Duration for your site. If you’ve set up MonsterInsights properly, you’ll see a new menu added onto your WordPress dashboard menu and a MonsterInsights dashboard widget. You can find the Average Session Duration in the dashboard menu itself. You can also view this report by visiting Insights » Reports from your WordPress dashboard. Once you have the report in your hands, you can analyze it as per your content. Normally, we can assume that more time means more engagement but this can’t be true if your page is meant for referring traffic to another domain / landing page. A bounce takes place when users exit your site from the same page where they landed first, without clicking any links or buttons on the page. It’s a single-page session on your site. In other words, a higher bounce rate means that your site is less engaging. 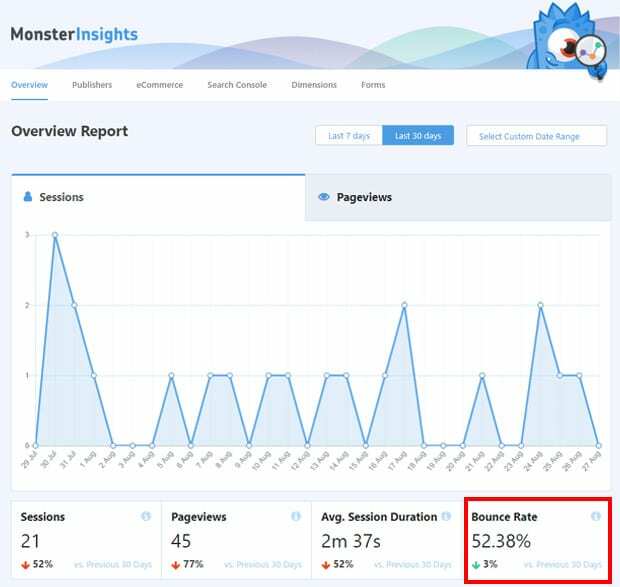 With MonsterInsights reports, you can view your site’s bounce rate in the overview report. So, you can find your site’s bounce rate both in the dashboard widget and the Overview report in the reports page. To access the Overview report in the reports page, you’ll need to go to Insights » Reports from your WordPress dashboard. This is the average bounce rate for your entire site. 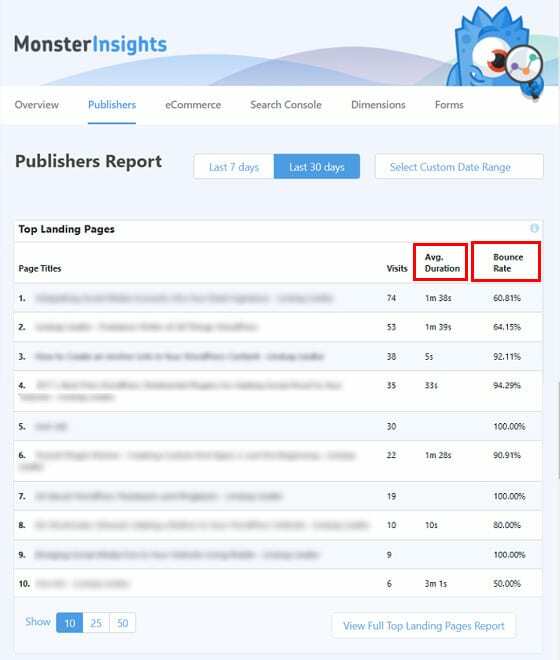 To view the bounce rate for individual pages / posts, you’ll need to view the Publishers report, which we’ll show you in the next section. Tracking the most popular content helps you to identify where your users are engaged most. And the least popular content (top exit pages) shows you which content on your site isn’t working. 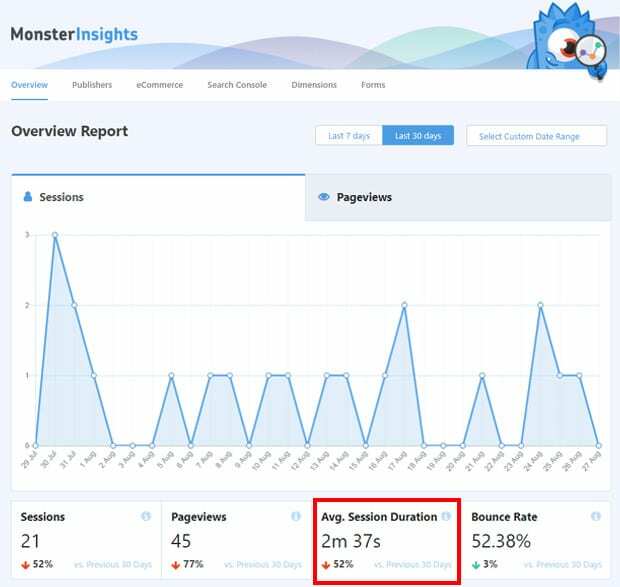 In MonsterInsights reports, you can find top landing pages and top exit pages in the Publishers report. So, you’ll need to go to Insights » Reports and click the Publishers tab. Now, you can see the top 10 landing pages on your site. This gives you a clear idea what type of content is most popular among your site visitors. If you want to make your site more engaging, you’ll need to focus on creating similar types of content. This report also shows Average Duration and Bounce Rate for each of your top landing pages. Analyzing these metrics, you can find out exactly how engaging your pages are. 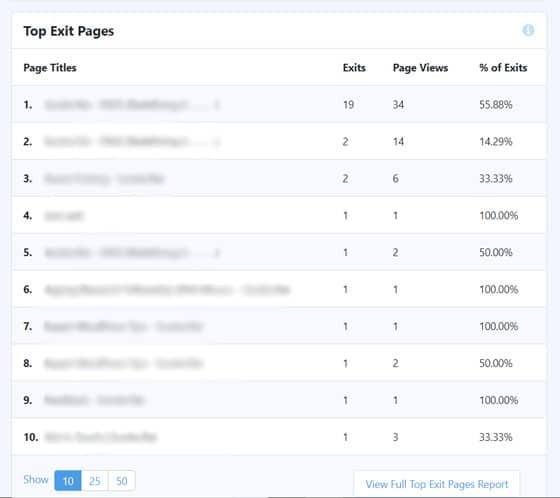 Another report you’ll find on the Publishers report page is Top Exit Pages. Exit pages are the pages where users click the Exit icon and leave your site. Normally, they’re taken as the least engaging pages on your site; however, that may not always be the case. If the page has no links, buttons, CTAs to click through, or the user completes a purchase, exit on that page can be a perfectly normal thing. But, if a content-rich page with lots of CTA elements has the high exit rate, you can consider them to be the least engaging pages. With this report, you can analyze why the particular pages on your site are failing to engage users. Then, you can edit and make changes to make them more interactive and engaging. Forms are one of the major points of interaction on your site. 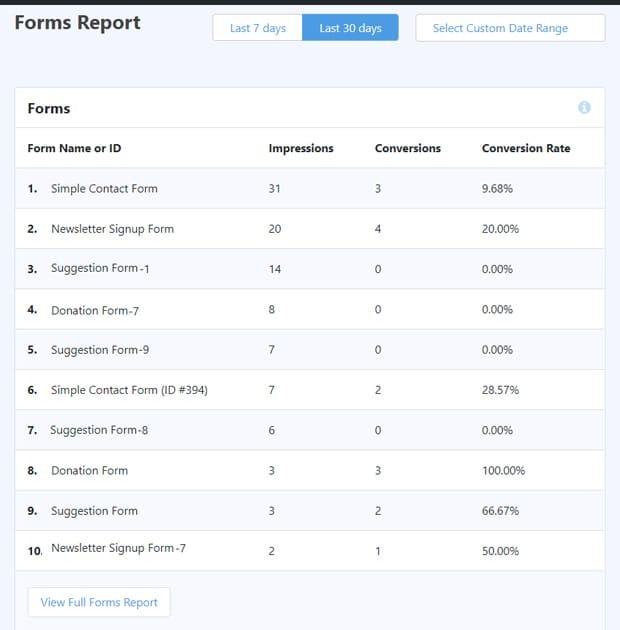 So, tracking forms’ performance can give you insights on your site’s user engagement. Forms tracking in WordPress is easy with the MonsterInsights forms addon. All you need to do to set up forms tracking is install the correct addon and activate it. 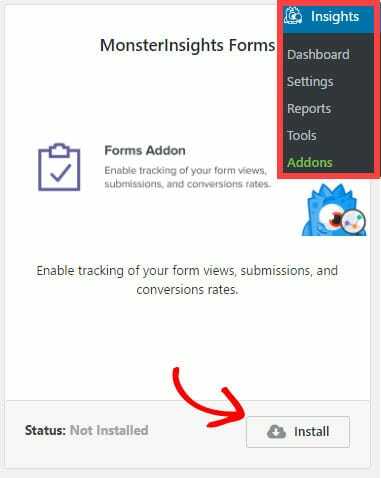 Go to Insights » Addons and navigate to the MonsterInsights Forms addon and click the Install button. Then, don’t forget to Activate it. That’s it. You’ve set up forms tracking. Now, it’ll start gathering your users’ interactions with your forms and provide you with reports. To view the reports, you’ll need to visit Insights » Reports » Forms from your dashboard. You’ll see which form has the highest impressions, highest submissions, and the highest conversion rate. This helps you to identify what type of form is filled out most. Then, you can optimize your least-performing forms and improve your site’s engagement. If you’re selling any digital or physical products, tracking your eCommerce transactions can also help you see the user engagement levels on your site. eCommerce tracking is quite complex with Google Analytics itself but MonsterInsights makes it simple with the eCommmerce addon. It helps you set up eCommerce tracking easily and offers really simple and easy-to-understand reports. If you want detailed instructions, here’s our complete guide on how to track eCommerce conversions in WordPress. 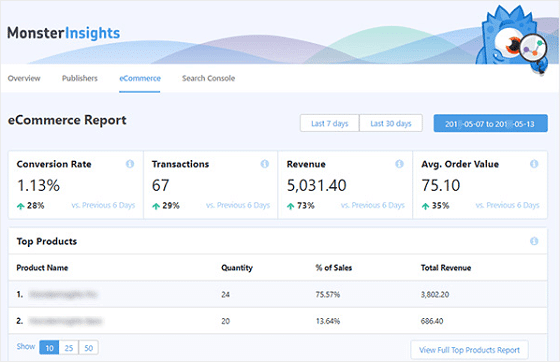 After you’ve set up eCommerce tracking, you can find the eCommerce reports by going to Insights » Reports » eCommerce from your WordPress dashboard. As you can see in the above screenshot, you’ll see the conversion rate, total transaction, average order value, and total revenue. Most important for user engagement is the list of top products. When you have the list of top products, you can analyze what attracts users most. 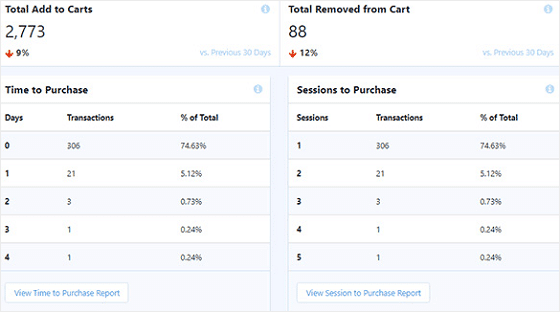 As you scroll down, you’ll find more eCommerce reports including Time to Purchase and Sessions to Purchase. These reports are useful for analyzing your users’ interaction with your online store. How much time and how many sessions users take to purchase a product can help you understand their engagement on your site. We hope this article helped you to learn how to track and measure user engagement in WordPress using Google Analytics.